The blue finch is a small tanager originating in South America, specifically in Brazil and Bolivia. 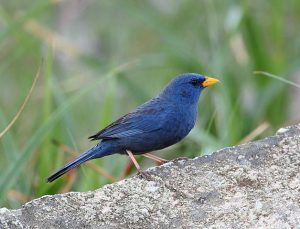 The males have a bright cobalt blue plumage, although after the molt the feathers have a rufous-brown hue with broad edges. Females, on the other hand, have a rufous brown upper plumage, with buffy white underparts marked with dusky streaks. Color Breeding males exhibit a bright cobalt blue plumage. After the molt, feather becomes broadly edged rufous-brown. 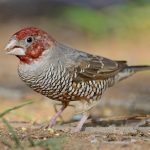 The upper plumage in females is most rufous-brown, on the underside, they are buffy white with dusky streaks. 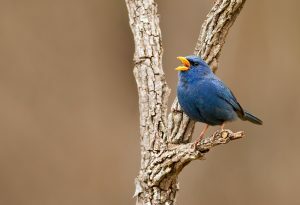 Sound and call Blue finches have a sweet and repetitive sound which can be heard in the morning and afternoon. Diet Seeds, insects and plant matter. 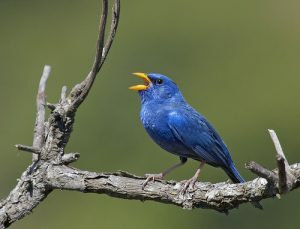 Throughout their habitat, blue finches are put up for sale, bought by enthusiasts who keep them as pets, because of their bright blue plumage and sweet singing calls. Blue finches get their exercise by flying, so it is advisable to put them in an enclosure with at least an area of 12 inches by 18 inches per pair. Feeders may be provided for food and water. Keeping dishes for treats and grits is a good idea. An area for a bath and a bird perch should also ideally be provided. Enclosures should be kept on a stand or hung in such a way that it is 5-6 feet from the ground. The spot should have good light, ventilation and must be free from drafts. Finches appreciate nest boxes to sleep in and do not fuss much over it. A nest box with an artificial plant covering should be enough to provide them with the privacy they need. They do not, however, like their nest to be frequently checked, more so during their breeding season. 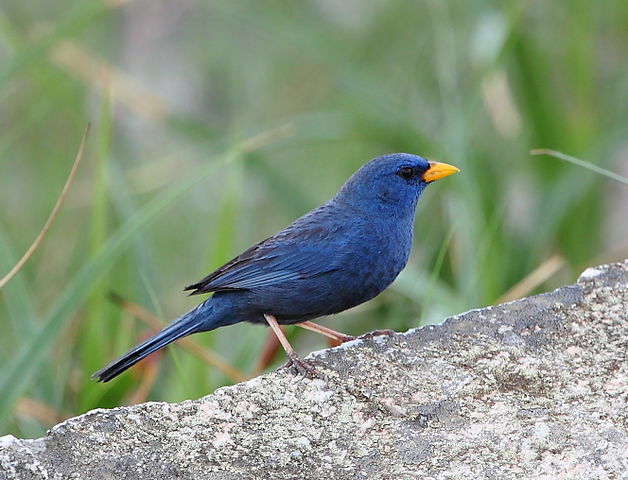 Blue finches thrive at average daytime temperatures between 60°F to 70°F whereas night temperatures can go down as low as 40°F. A lower temperature than 40°F can get the bird to feel uncomfortable and susceptible to health complications. 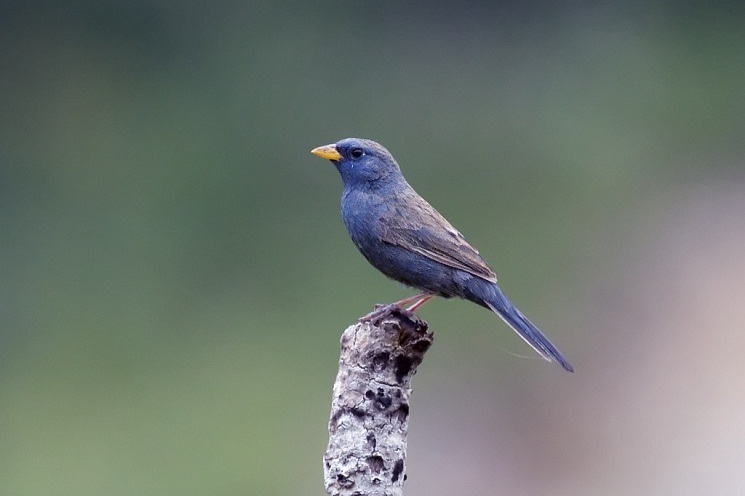 As with most finches, blue finches are very social with a good personality. They do not harm children, visitors or other pets. 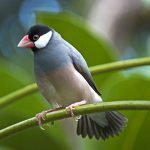 Two male blue finches should not be housed together during mating season as they would become overly aggressive towards one another. When kept in small cages, they exhibit an initial shyness to start singing in the presence of people. 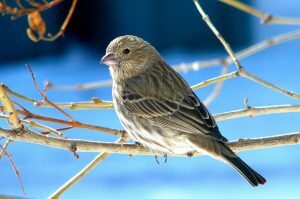 Finch seeds are the ideal everyday food for a blue finch. Supplements like sprouted seeds and spray millet, protein rich foods, mealworms and fruit flies or even dried dog food, cod liver oil supplies the bird with vitamins. Grit with charcoal is essential to aid your bird’s digestion. Calcium rich foods like a cuttlefish bone should regularly be given as it would help the bird develop a strong beak and firm eggshells during breeding. 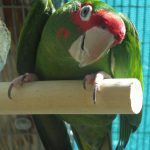 Treats of seed with honey, fruits and vegetables are fun for your bird and also nutritious. 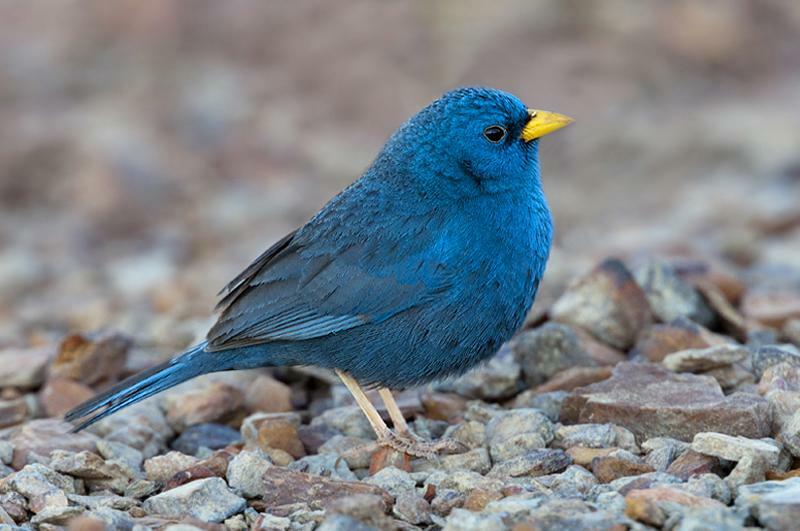 Blue finches require very little maintenance and care, a clean enclosure with fresh food and water daily must be provided to ward off illness and disease. 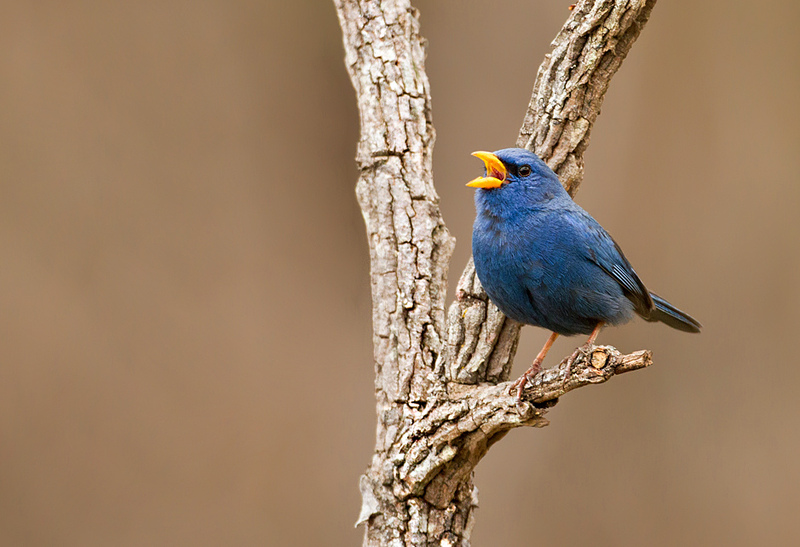 Blue finches are popular as pets because of their busybody ways, their plumage and for their sweet song calls. 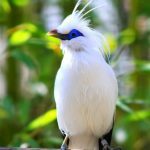 When the need to handle the bird arises, whether to trim its nail or otherwise, a palm has to be placed on the bird’s back, followed by the wrapping of the fingers with the thumb and the forefinger on either side of the bird’s head. They rarely bite, and even if they do, it is not that painful as they lack a strong jaw. Blue finches are generally hardy, and most illnesses can be traced to the cause of a dirty enclosure, improper food habits, and drafts. A balanced diet and plenty of exercise prevent most illnesses. 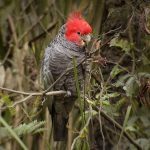 Occasionally checking the bird for feather loss, scaly leg disease, respiratory problems, and loss of appetite and acting swiftly upon finding any discrepancy will ensure that your bird has a long and healthy life. A blue finch can cost you anywhere between$20-$40. 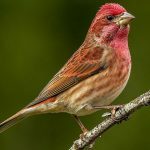 Until very recently blue finches were classified in the bunting and the American sparrow family, studies have however shown it to belong in the Thraupidae. 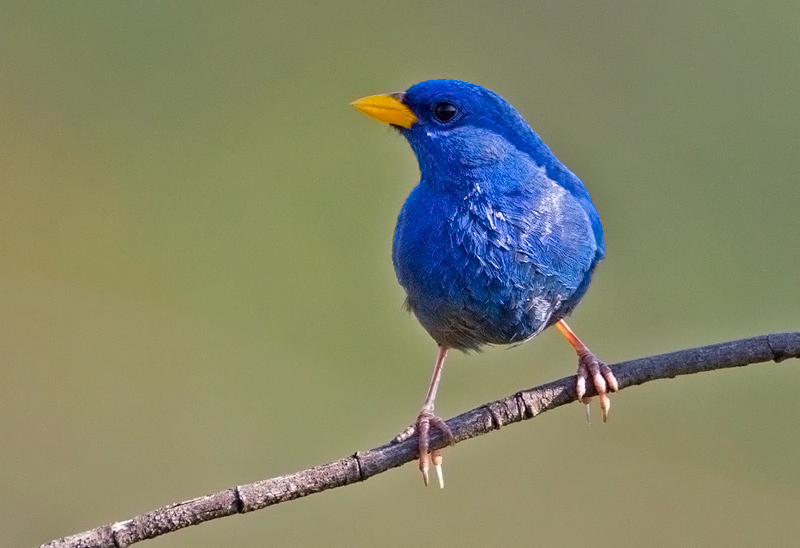 Blue Finches have been known to live up to 27 years under the right care. 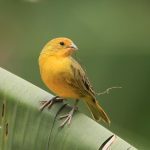 One Response to "Blue Finch"
I was wondering where I can buy a pair of yellow billed blue finches?